How do scientists study neuroeconomics? There are now many ways to look inside the brain. Older brain-imaging technologies like MRI, PET, and SPECT allowed us to take a snapshot of the brain. By recording blood flow or glucose uptake, we could map a pattern of brain activity at a given point in time. However, the development of fMRI brain-imaging technology has completely changed the game. Now, by recording the behavior of magnetized atoms, we can watch brain activity over time. We have moved from still shots to movies. This is critically important if we want to investigate brain activity during a sequence of mental processes. With fMRI technology, we can put people in scanners and watch how their brains respond while we run an experiment. This is a photograph of an MRI brain scan. Arrows point to areas of the brain that are close to those regions involved with our response to money. 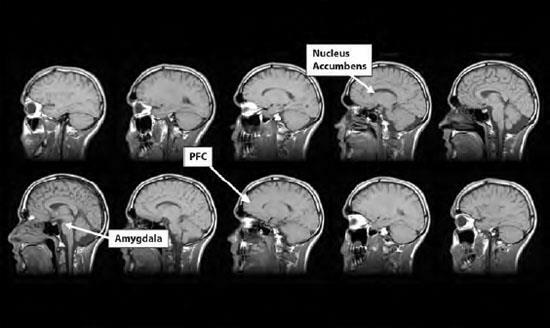 The prefrontal cortex (PFC) is involved in our analysis of long-term consequences of financial decisions. The amygdala is particularly responsive to fearful cues, and the nucleus accumbens is a key player in the reward system, mobilizing us to pursue rewarding stimuli (iStock).